The Sacred Heart Cathedral serves dual roles as a Parish church for St Benedict’s Parish and as the Cathedral for the Diocese of Maitland-Newcastle. Sacred Heart Cathedral holds a special place in the affections of Newcastle Catholics. Both its size and status make the Cathedral a popular choice for weddings, large funerals and many parents like to bring their children to be baptised in the church where they were married. The Cathedral also plays a major role in Diocesan events, such as the annual Chrism Mass in Holy Week, the ordination of clergy, and for other important Diocesan celebrations throughout the year. The Sacred Heart community works to accommodate these ‘Cathedral’ functions and its role in the Inner City Parishes along with maintaining the local community for whom the Sacred Heart is their ‘Parish’ church. On Saturdays at 10 am, we pray a Novena to Our Lady of Perpetual Succour. This Novena began in the Diocese in 1948 at the Redemptorist Monastery at Mayfield. The closing of the Monastery in 2003 saw the Novena transferred to the Sacred Heart Cathedral. A special shrine to Our Lady of Perpetual Succour has been established in a transept that was formerly used as the Nun’s Chapel. This is available for private prayer. The Sacred Heart Columbarium stands behind Sacred Heart Cathedral. The columbarium was redeveloped in 2014-15 into its current form, providing niches for the permanent placement of the ashes of deceased Parishioners or others with a strong connection to the Cathedral. Until 1873 the Newcastle area was administered by the Archbishop of Sydney. Right Reverend James Murray, the first bishop of Maitland, established the parochial district of Hamilton in 1884. The current site between Hunter and Parry Streets was purchased from the AA Company and the first school-church built in 1875, near where the Southern Cross Hall now stands. 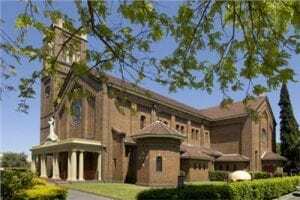 The present Sacred Heart Church at Hamilton opened on 15 June 1930, Trinity Sunday. In 1995, it became the Cathedral Church of the newly renamed Diocese of Maitland-Newcastle. It was designed by Mr. Peter Gannon, who was responsible for many churches in the Diocese. The original copula, made of concrete, was severely damaged in the 1989 earthquake. It is now located in the grounds of the Cathedral as a memorial to quake victims and has been replaced by a new copper cupola.